Father turns and takes my face in his hands so that I am forced to look into his eyes. "I am not sure you understand, Cleopatra. I'm not sure you realize yet that my wish is for you to rule Egypt someday, and that burden--and the power--will then become yours." As the third daughter, with two younger brothers bearing their father's name, Ptolemy, Cleopatra is not the natural successor to the throne, but from the time her father the Pharoah Ptolemy XII, gives her that charge, young Cleopatra begins to prepare herself. Superbly educated, fluent in many languages, trained in science, mathematics, and the literature of the ancient world, Cleopatra is a talented scholar, and her vain and rivalrous older sisters, Tryphaena and Berenike, sense the threat of her intelligence even by the time she reaches the age of eleven.. Despite their schemes to thwart her at every turn. Cleopatra remains her father's favorite, and as she matures into a politically astute and beautiful young woman during her father's three-year exile in Rome, she comes to fear for her life as her sisters seize the throne. But as Cleopatra nears the age of fifteen, Berenike has Tryphaena murdered, and although their father returns from Rome, where he has borrowed vast sums beyond Egypt's means to repay to raise an army to take back his throne, even the defeat and execution of Berenike doesn't give Cleopatra any security. Her father makes her his queen, his titular co-ruler, but forces her to marry her younger brother Ptolemy XIII, still a child, and the crushing debt and failures of the Nile's inundation for successive years leave Egypt vulnerable to the empire-building Romans. With her father's death and the very young Ptolemy proclaimed Pharoah, Cleopatra needs a strong ally, and finds it through her seduction of Julius Caesar, who temporarily vanquishes her brother and helps her secure her claim to the throne of Egypt. I must... keep the reins of power in my own hands if I am to restore prosperity to Egypt. The welfare of the people rests entirely on me. I trust only myself, and I am ready. In her highly reviewed Young Royals and Royal Diaries series, which include such notable books as Mary, Bloody Mary: A Young Royals Book, Beware, Princess Elizabeth: A Young Royals Book, Anastasia: The Last Grand Duchess, Russia, 1914 (The Royal Diaries), and her recent The Bad Queen: Rules and Instructions for Marie-Antoinette (Young Royals) (see my 2010 review here), Meyer, herself the queen of her genre, builds a first-person narrative which is reasonably accurate and filled with the details of life in the period, introducing believable conversations, thoughts, and memorable characters which makes this account a truly absorbing novel. Meyer hits the high points of Cleopatra's known history, her childhood trip down the Nile with the Pharoah which gives her insight into her kingdom, her struggle to stay alive during the precarious rule of her sisters and the young Ptolemies, her contrived meeting with the conquering Julius Caesar to gain his support of her rule, their voyage down the Nile, her subsequent romance with Marcus Antonius after Caesar's assassination, and her own suicide in her tomb to avoid her certain captivity in chains by the future emperor, Caesar Augustus. A useful appendix, "Cleopatra in History," includes a brief bibliography, ten relevant web sites, a time line, and a short summary of the Egyptian and Ptolomaic deities and calendar, making this historical novel a useful piece of adjunct reading for ancient history courses. 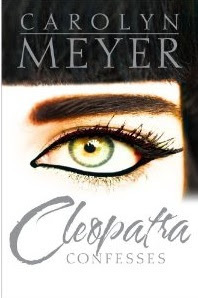 In Meyer's skillful prose, the much-portrayed and parodied Cleopatra becomes a real child and young woman, shaped in the crucible of the palace intrigues and international politics of her time, accustomed to luxury and yet, except for a very few trusted friends, alone and on her own in a terrible time. Meyer manages to walk the line between grim historicity and the superficialities of princess pandering in this account, portraying the legendary Cleopatra as a young woman both as fascinating as history has always made her and yet humanly recognizable for modern young adult readers.